I’m a nails person. I love having them done and doing them myself, and you’ll always see my nails painted. Last week I got my first gel manicure and so far I’m liking it. Although, I wish I would have had my manicurist do some fall nails instead of the sheer color I went with. I am in full on fall mode, from my wardrobe and nails, to my home and food. Are you with me? Have you ever seen a nail color and wondered, would that look good on me? My daughter and I love to stand in nail polish aisle at our favorite store and look at all of the colors. But I’m always curious if the color will be too dark or too pink or…you get the idea. Well, now there’s a way to “try on” your nail color thanks to the #1-selling nail color and nail care brand in the US, Sally Hansen! How does it work? You simply scan your hand from any smartphone and you can instantly curate your own color choices. That means you can choose from over 200 Sally Hansen nail polish shades in real time, on your nails, before you purchase! Not only that, but it generates personalized colors for you based on your skin tone. If you want to know what fall nails and shades will be flattering for you, you got it with the push of a button. Here’s the gorgeous Julianne Hough recently trying out the app. Would You Like to be a Hand Model? 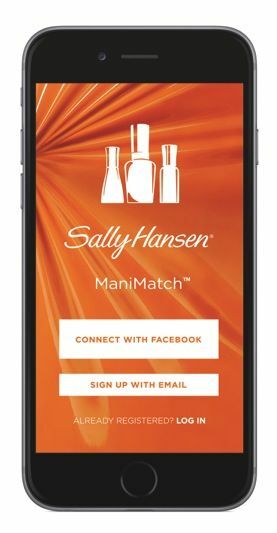 In celebration of the ManiMatch app launch, Sally Hansen is hosting a #ManiMatch Hand Model Contest. If you’ve ever looked at your hands and thought “I could totally be a hand model”, entering is as easy sharing a photo via Instagram or twitter with hashtag #ManiModel and #contest. The winner will be featured as the hand model on the Sally Hansen Social Media channels. Go for it!! Sally Hansen teamed up with several designers to create some stunning nail shades for fall. Below are the designers, information about their partnership and of course, the nail shades! Prabal Gurung collaborated with Sally Hansen for the tenth consecutive season to create three exclusive nail polish shades to compliment his Fall 2015 collection, which is a graphic, modern take on effortless glamour. The exclusive Prabal Gurung for Sally Hansen collection includes: Complete Salon Manicure in Midnight Affair, Leaf Peeper and Concrete Jungle. For the nineteenth consecutive season, Tracy Reese collaborated with nail color leader Sally Hansen to create three exclusive nail colors that complemented her Fall 2015 Collection. The exclusive Tracy Reese for Sally Hansen collection includes: Complete Salon Manicure in Yummy Yam, Maasai Red, and Winter Sky. For the fifth season in a row, Rodarte has once again turned to nail color authority Sally Hansen to create three limited edition Complete Salon Manicure nail polish colors. The designers’ highly anticipated Fall 2015 Collection served as a muse for Sally Hansen’s nail color creations. The Fall 2015 nails are inspired by translucent color and the subtlety of watercolors. The exclusive Sally Hansen inspired by Rodarte collection includes: Complete Salon Manicure in Gold Glass, Beige Glass and Rose Glass. All of these nail colors can be found in Sally Hansen’s award-winning Complete Salon Manicure collection that infuses trend-setting shades with an expert quality formula to deliver salon-caliber results. Sally Hansen Complete Salon Manicure delivers seven salon manicure steps in one bottle. Chip resistant strength joins gel-quality shine. Must-have color meets nourishing benefits. Plus, a built-in base and top coat, it’s everything you need to achieve a professional manicure at home. These limited-edition colors will be available beginning September 2015 for $7.99 each. Which nail color stands out to you? I’m partial to the reds and pinks myself. Just beautiful! Don’t forget to give the ManiMatch app a try, plus look for these fall nails from Sally Hansen at a store near you!